The year 2016 has been really kind to our alumni honorees this year. Bruno Hortelano (Cornell ’14) has become a national celebrity in Spain this year. He kept breaking the national records and all-time Heps records in the 100m and 200m throughout the spring and summer months. He has clocked out at 10.12 in the 100m and 20.12 in the 200m. 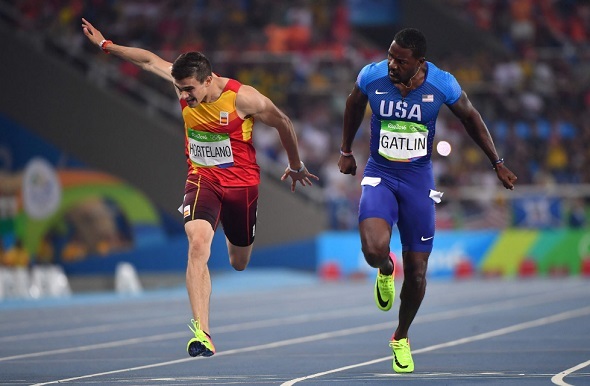 That 200m time came during the preliminary round of the 2016 Olympic Games, where he won his heat in a photo finish. He surprised many of his competitors and NBC announcers as he won out in lane 8 and nipped Jamaica’s Yohan Blake at the line. He ultimately finished 10th overall as his semifinal time of 20.16 did not advance him to the eight-man final. Earlier in the summer, Hortelano won his first international gold medal at the European Athletics Championships in the 200m. Now originally, he finished second to the Netherlands’ Churandy Martina; however, officials reviewed the tape and disqualified Martina after seeing evidence of Martina stepping on the inside line at the end of the curve, resulting in an upgrade to Hortelano. Hortelano wasn’t notified of his upgrade until a reporter asked him in the media zone about how it felt to win the gold medal and be a European champion, resulting in a reaction that just spread across the internet like wildfire. Kate Grace’s (Yale ’11) year was a surprise to many in the track world, including herself. She had missed the entire 2015 season due to injury, switched coaches, and moved across the country to keep training, so perhaps she was trying to have reasonable expectations for 2016. But she worked with her coach on a list of season’s goals, including different tiers of goals. The “dream” goal was making it to the Rio Olympic Games. Her “dream dream” goal was making it to an Olympic final. Once she was on the track, she just kept getting better. She lowered her personal bests in the 800m, 1500m, and indoor mile events, and was placing in the top 2 in her five pre-Olympic Trials races. 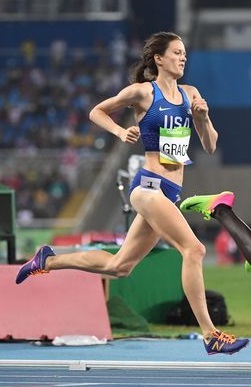 While she could have tried to chase Team USA berths in both the 800m and 1500m, she stuck with her gut and went for the 800m. She was rewarded by winning the most unpredictable Olympic Trials 800m race as she had to dodge a few fallen competitors with 100m to go and sprint away to her first national title. Once in Rio, she knew she needed to run even faster if she wanted to make the Olympic final. She had to rely on being the fastest non-auto time in order to advance out of the preliminary and semifinal rounds, reaching her “dream dream” goal of making the Olympic final. She ultimately finished eighth in the final with a time of 1:59.57. In her final meet of the 2016 season, Grace set another 800m PR of 1:58.28 at the Diamond League final in Zurich. For this season, she was ranked by Letsrun.com as the 10th best 800m female runner of 2016 and the top American woman in the event. Abbey D’Agostino (Dartmouth ’14) made headlines during the Olympic Games for reminding the world of the definition of the Olympic Spirit. Even though she got knocked down during the Olympic Games 5km preliminary round, she got back up and encouraged a fellow fallen competitor Nikki Hamblin from New Zealand to finish the race, despite the fact they still had about 2km to run. D’Agostino managed to finish, but in pain and with additional emotional support from Hamblin. Before she was wheeled off the track, she gave Hamlin a celebratory hug for making it to the finish. Many international figures like IOC President Thomas Bach and USA President Barack Obama referenced this act as one of the defining moments of the games. D’Agostino did undergo surgery to repair her torn ACL and has just recently been cleared to start jogging again. We hope to see her return to form and back on the track in the upcoming year. This entry was posted on Saturday, December 31st, 2016 at 4:00 pm. It is filed under Alumni, Athletes, Awards, Spotlight. You can follow any responses to this entry through the RSS 2.0 feed.